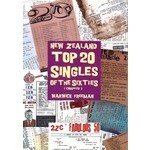 The charts used in this book for the time leading up to March 1966 are a merger of the numerous pop charts gathered from the various sources throughout New Zealand during this era. Essentially on a week by week basis from 1960 to early 1966. Also included is local sales data as compiled at the time by our own Billboard correspondant Fred Gebbie. The charts available were 'tossed' into a computer program which utilised a point system to create an overall top 20 for every week. Overall the final outcome appears remarkably consistent, and in line with what was played on the radio during this period. A top 5 week by week listing for the whole sixties era (January 7 1960 to December 25 1969 - 521 weeks).